Malachi 4:2 But for you who fear My name, the sun of righteousness will rise with healing in its wings; and you will go forth and skip about like calves from the stall. One of the biggest challenges of painting watercolors is knowing when to add the color; every watercolor painting is truly an experiment. It is very difficult to place yellow and blue in the same areas without making green which I didn’t want. 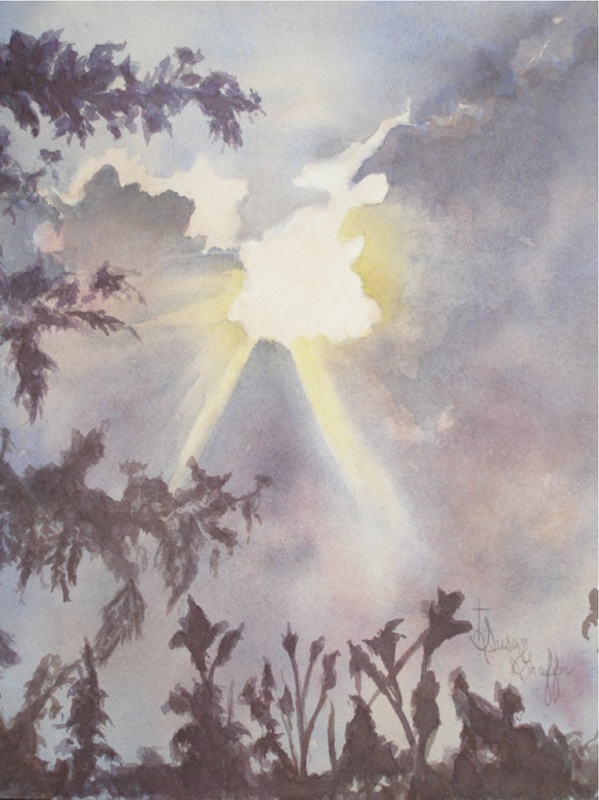 This sky was painted using a wet into wet technique allowing the blues and violets to mingle. I laid the yellow in first, reserving the yellow and white areas. The mimosa tree and calla lilies in the silhouette are painted in muted violets to balance out the painting. This 11×14 painting was done on 140 pound cold pressed paper.